NCERT Solutions for Class 12 Maths has been written to help students like you who are appearing for different board exams as well as the JEE. It provides sound knowledge and understanding of all important concepts covered in each chapter in the NCERT textbooks. There are 13 important chapters from the NCERT textbook. Both problems and their detailed solutions are provided. The solutions have been devised by India’s best teachers to help students grasp basic concepts better and faster. 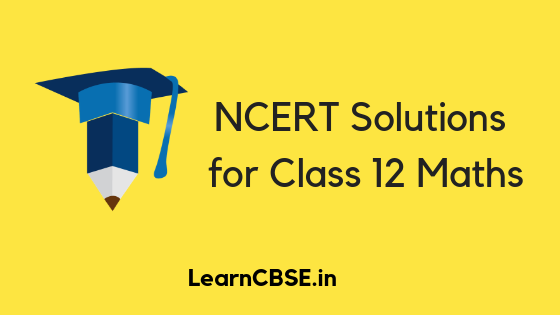 Class 12 Maths NCERT Solutions is the perfect guide to help you prepare for CBSE exams as well as engineering entrances like the JEE. The National Council of Educational Research and Training (NCERT) is an autonomous organization of the Government of India that was established in 1961 as a literary, scientific and charitable society under the Societies’ Registration Act (Act XXI of 1860). Its headquarters are located at Sri Aurobindo Marg in New Delhi. It sets the curriculum for all schools that follow the Central Board of Secondary Education (CBSE) across the country. Your performance in the board exams will play a role in determining your admission into a good college or even your dream college! That will undoubtedly induce a lot of pressure upon you and you may tend to get demotivated or stressed out. To help you overcome such situations, LearnCBSE is a platform all the way helps you to crack your target. if you have any queries leave in the comments box.